Many people today are more conscious of health issues, eating better, getting exercise and staying fit with holistic methods and treatments, yet there is one killer they have little to no control over, secondhand smoke. One point one billion people around the world use tobacco and 15 billion cigarettes are sold daily—that’s about ten million every minute. One out of every five deaths in the United States alone is smoking related, an estimated 480,000 deaths per year. The numbers are staggering but statistics bear out the facts and illustrate what has happened, and what can happen with constant exposure to smoke. Secondhand smoke consists of the plume of chemicals and burning agents that come off the tip of a lit cigarette, cigar or pipe, including the smoke that is released from the mouth of a smoker. It is hard to escape. If someone in your home only smoked in one room, the chemicals created can spread quickly from room to room and can hang around for almost five hours. So multiple cigarettes? Well, the 7000 chemicals in the puff of smoke will move faster and linger longer. Hundreds of those chemicals in a cigarette are toxic, and approximately 70 different types of those chemical puff ingredients can cause cancer. Many smokers know these facts but few can or will try to quit. In the U.S., according to the Surgeon General—the country’s doctor—about 7300 deaths from secondhand smoke are due to lung cancer; and 33,950 deaths from heart disease occur from secondhand smoke every year. Between when statistics were collected for the years 1964 to 2014, 2.5 million people died from exposure to secondhand smoke and heed this: there is no risk-free level of exposure. Some of the chemicals in secondhand smoke are: formaldehyde, benzene, vinyl chloride, arsenic ammonia and hydrogen cyanide. Look them up individually for a scary primer on what not to breathe in. Smokers at home and in the workplace or some public sites are not only putting their health on the line but they are exposing others around them to the risk as well. 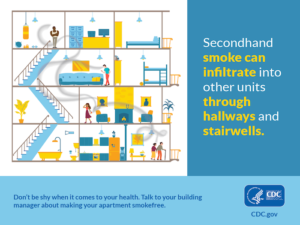 Even if you took steps to open windows or use an air filter, it does not prevent people from breathing secondhand smoke. And isolation doesn’t work in casinos, restaurants or bars. And what about the hard dollar costs? Tremendous. Smoking-related illness costs more than $300 billion a year—that is $170 billion for adult medical care and $156 billion in lost productivity. In the year 2016, 37.8 million adults in the United States were cigarette smokers and over three-fourths of them smoked every day. And, the data collected tell us that people with lower income and lower education are less likely to be covered by smoke-free laws in worksites, restaurants, and bars. Children often take the brunt of parent’s smoking and as a result, they get more ear infections, face asthma attacks, and respiratory infections such as bronchitis, coughing, sneezing, pneumonia and babies have a risk of sudden infant death syndrome (SIDS). Because of this, many states outlaw smoking in a car where children are basically held captive: California, Louisiana, Arkansas, Utah, Vermont, Virginia, Puerto Rico, Guam, Oregon and Maine have banned smoking in a car when a child is present (the age is a variable). Oklahoma, Texas, Vermont, and Washington State do not allow smoking in foster parent’s homes and cars. After just half a cigarette has been smoked in a car, the quality of the air can reach levels 10 times over what the United States Environmental Protection Agency considers hazardous. More men smoke than women, (17.5 to 13.5 %); and age 45 to 65 years is highest at 18%, but the 25 to 44 age group isn’t far behind at 17.6%. In 2016, almost a third of American Indian or Alaska Native adults in the United States smoked cigarettes, 31.8%, compared with 15.5% of U.S. adults overall. Certain groups seem to have high levels of secondhand smoke exposure. These include: Blue-collar workers, service workers and the hard-hat industry of construction workers. Secondhand smoke exposure is higher among people with low incomes. During 2011–2012, more than 2 out of every 5 (43.2%) nonsmoker who lived below the poverty level were exposed to secondhand smoke. Nationally, nearly 1 in 5 adults (or 45.7 million adults) have some form of a mental health condition, and 36% of these people smoke cigarettes. Cigarette smoking prevalence is estimated to be at least two times higher among adults living with HIV than in the general population. In the United States, cigarette smoking frequency is higher among people currently serving in the military than among the civilian population. Smoking prevalence among lesbian, gay, bisexual, and transgender (LGBT) individuals in the United States is higher than among the total population. 16.5% of non-Hispanic Black adults in the United States smoked cigarettes, compared with 15.5% of U.S. adults overall. Granted, smoking levels have gone down over the years and that may be attributed to laws with nonsmoking areas, and the fact that smoking around nonsmokers is less socially acceptable. But, you still need to hold firm and do not allow anyone to smoke in or near your home or car. Look for restaurants and bars that ban smoking and make sure your children are in daycare and schools that are tobacco-free. A new study on the use of electronic cigarettes among adolescents reports striking findings: that young users of “pod" e-cigarette devices (or “vapes") are absorbing nicotine at levels approaching nicotine exposure from what are considered traditional, combustible cigarettes. Scientists at Roswell Park Comprehensive Cancer Center collaborated with pediatricians from Stony Brook Children’s Hospital for the research and also reveal that Juul and similar products contain high concentrations of a modified, salt form of nicotine, which is more readily absorbed upon inhalation. Fisher, Jr., Edwin B. Ph.D., with Tony Goldfarb. American Lung Association: 7 Steps to a Smoke-Free Life. New York: John Wiley & Sons, Inc., 1998. Book. Smokin’ Somebody Stop Me: Why Kids Smoke. Wynnewood, PA: Schlessinger Media, 2006. DVD. Stop Smoking Now: Reasons Not to Smoke When You’re Pregnant Hosted by Rob Reiner. Parents Action for Children, 2005. DVD. “Cancer Among Adults from Exposure to Secondhand Smoke"